Explore the interactive map, lower right, of landmarks and locales that have inspired posters over the years. The Syracuse Poster Project, founded in 2001, brings together community poets and artists to create an annual series of illustrated poetry posters. From 2001 to 2017, we collaborated with a senior illustration class at Syracuse University, whose students would select and illustrate haiku. In 2018, we broadened our reach by implementing an open call for Central New York artists. Each year approximately 40 artists commit to participating. After screening haiku, we allot four of our favorites to each artist. Artists then select and illustrate their preferred haiku. We occasionally supplment the standard posters with a "reverse process" poster. We commission an artist to create an image. We then publize the image and invite our poets to complement it with a haiku. In November, we select the best of the traditional and supplmental work for a total of 16 to 18 posters. Through the city’s downtown poster panels. In April, the Downtown Committee of Syracuse posts full-format posters (43 x 62-inches) in the poster panels of Salina and Warren streets. The posters remain on display for a year. Through the sale of poster prints. These 11 x 17-inch prints are small versions of the full-format posters. Through the display of poster prints. 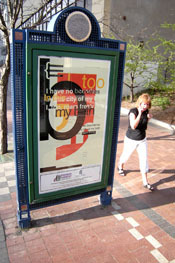 A framed set of poster prints goes on rotating loan to downtown exhibit spaces throughout the year.